We’re hitting the road to visit local game stores! 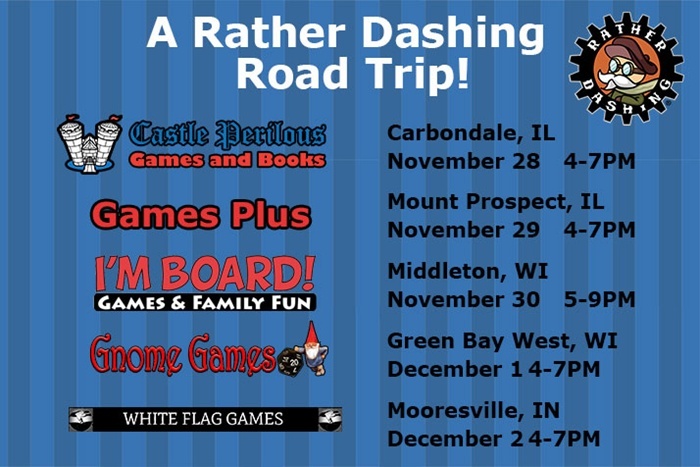 Join the Rather Dashing team as Tim and Mike travel around IL, WI, and IN next week visiting some of your favorite local game stores. They will be teaching demos of Element and Hafid’s Grand Bazaar, two of our 2017 new releases that both make great gifts and encourage quality family time! Be sure to pick up an Uncle Barnaby poster to remind you to Play More Games and grab the promo cards for the games while supplies last. We look forward to meeting many of our dashing supporters while we are on the road! Evil stirs in the catacombs at the center of dense woods not far from your village. Do you have the courage to venture into the depths and combat the creatures that lurk within? 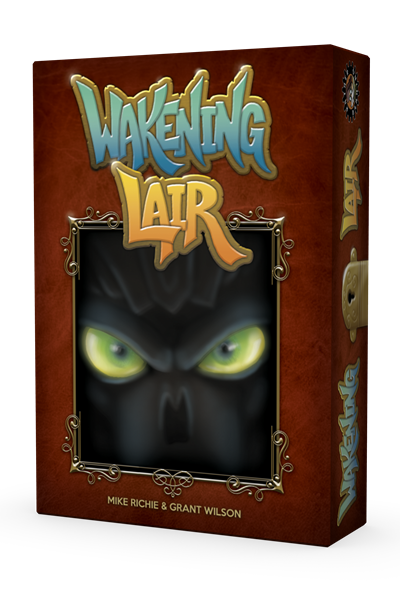 Rather Dashing Games is excited to announce Wakening Lair, a fully cooperative dungeon delve card game for 2-6 heroic adventurers, coming in March 2018. Built long ago and all but forgotten, the lair has lain silent for generations. A noxious reek now wafts from the entrance, and unsettling noises echo up out of the darkness, signaling that something terrible is about to awaken. Play heroes from nine different character classes, each with unique abilities to help vanquish your foes. Double-sided hero cards provide both male and female versions of each class for a total of 18 heroes to choose from. In Wakening Lair, players take turns exploring rooms, defeating monsters, disarming traps, and gathering weapons and magic items to equip themselves for to battle the Monstrous Terror. There are six different Monstrous Terror options, and the Monstrous Terror awakens at randomized moments, making each game unique. Once the Monstrous Terror awakens, you’ll need all your heroic might to keep it from escaping the lair and sweeping the land! Wakening Lair was designed by Michael Richie and Grant Wilson, the design team that brought you Element, Hafid’s Grand Bazaar, and more. The game is designed for 2-6 players, aged 14 and up, and plays in 30-40 minutes. Wakening Lair captures the narrative nature of an RPG in a cooperative card game format. A variety of monsters, weapons, treasure, and hero combinations offer a unique gameplay experience every time you play. Can YOU survive the Wakening Lair? Sharpen your wits and weapons for Wakening Lair, coming March 2018! Visit Us in Booth 552! 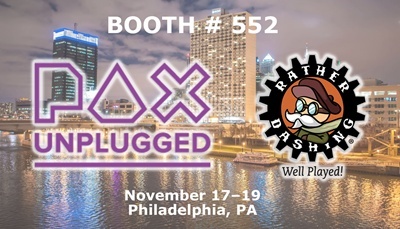 This week we are headed to Philadelphia, PA for the first ever PAX Unplugged! Join us in the Exhibit Hall at Booth #552 for demos of Element, Hafid’s Grand Bazaar, and This Belongs in a Museum. We will also have collectible buttons, game room posters, and more! Game designer Mike Richie will be available to sign copies of Element purchased at the show! This is a great opportunity to grab your own copy of our 2017 releases and take advantage of our show special! Get $10 off your purchase total when you buy 2 or more games. Our games make great holiday gifts!